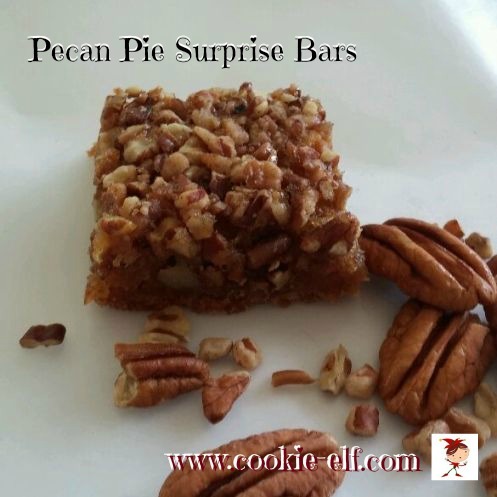 Pecan Pie Surprise Bars taste just like pecan pie, but are far easier to make and more portable. The recipe uses corn syrup and pecans, key to a successful pecan pie, but in place of a fussy pie crust is a simple cake mix base. Like other cake mix cookie recipes, these bars can be mixed together quickly. The cake mix makes putting the bars together easy because the mix saves you steps. This recipe is not only a winner when it comes to simplicity, but also in nationwide popularity. It won the Grand Prize in the iconic Pillsbury Bake-Off Contest # 22 in 1971, the first time the contest was held in the great state of Hawaii. Preheat oven to 350º F. Grease 13 x 9 baking pan with vegetable spray. Measure and reserve 2/3 cup of the dry cake mix to use for the filling. In a large bowl, using an electric mixer on low speed, mix together the remaining dry cake mix, butter, and egg until well blended. Press the base mixture into the bottom of the prepared pan. Bake the cookie base for 15-20 minutes or until light golden brown. Meanwhile, in a large bowl using an electric mixer on low speed, beat together the reserved 2/3 cup dry cake mix, brown sugar, corn syrup, vanilla, and 3 eggs until ingredients are combined and well moistened. Increase mixer speed to medium and beat the filling mixture for 1 minute. Pour the filling mixture over the warm cookie base. Sprinkle pecans evenly over the surface of the filling. Bake the bars for 30-35 minutes longer or until filling is set. Remove Pecan Pie Surprise Bars from the oven. Allow bars to cool completely on a wire rack, about 45 minutes. Store bars in an airtight container, with waxed paper in between layers, in the refrigerator. Heat oven to 350º F. Stir 1/3 cup all-purpose flour into dry cake mix before removing 2/3 cup for filling. Decrease dark corn syrup to 1 ¼ cup. Pecan pie filling is notoriously sticky. The filling in these bars is no exception. Make sure you grease the 13 x 9 baking pan very thoroughly before adding the base and filling. As an alternative to protecting the shape of the Pecan Pie Surprise Bars, prepare the pan by lining it with aluminum foil, allowing ends of foil to extend over two sides of the pan. Coat the foil with vegetable spray. Once bars have baked and are cooled, grasp ends of aluminum foil and lift them from the pan. Peel away the foil and proceed with cutting bars. Pumpkin Pie Bar Cookies: easier than pie!